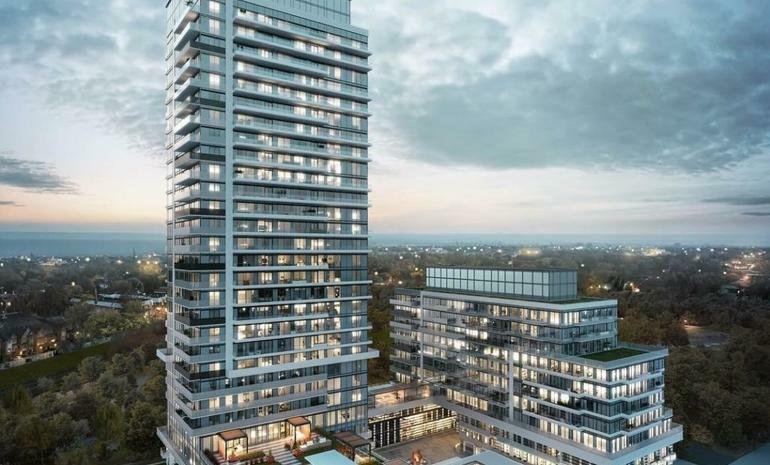 Empire Phoenix Phase 2 Condos Toronto is a recent residential project by Empire Communities offering spacious condominiums to buyers. Empire Phoenix Phase 2 Condos 251 Manitoba Street is designed by Graziani and Corazza Architects Inc. and the interior decoration is supervised by Figure 3. It has a strategic location and provides numerous amenities to the residents. You can take your pick from various Empire Phoenix Phase 2 Condos suites which are sized between 440 and 960 sq. ft. on an average. The ceiling height is estimated to be ranging from 8’ 6” to 9’.Other specifications include 11 stories of 499 suites with two-storey suites at ground level. The suites are marked from $424, 990 to $759,990. This is a newly launched project currently in preconstruction and is scheduled to be completed by November 2021. Some of the best Empire Phoenix Phase 2 Condos amenities include a spacious lobby with 24 hour attendant services, aesthetically landscaped courtyard with barbeque and fire pit, visitor suites, fitness centres, swimming pool with cabanas and loungers, yoga rooms, pet wash stations, games room, private dining, shared workspace with Internet connection affording group/booth seating, customised bar, spa with steam room and terrace. What are the locational advantages at this project? The Empire Phoenix Phase 2 Condos location offers several advantages to residents. Situated at the Queensway and Park Lawn in Mimico-Humber Bay Park neighbourhood of Toronto, the project has quick access to the Gardiner Expressway and Queen Elizabeth Way (QEW). The project is also well connected to the Mimico Go Station. There are four different bus routes to service the area, thus keeping the residents connected to many of the destinations. It will take you only fifteen minutes to drive to downtown Toronto and a few minutes of commute. Departmental stores like No frills, Metro and Caribbean Breeze are well connected to the project along with restaurants like Pizza Nova and Mr Sub. Some reputed educational institutions located in close proximity to the project are George R Gauld Junior School, Etobicoke School of The Arts, and School of Technology Inc. Nearby parks include the Grand Avenue Park, Winslow Dalesford Park and Manchester Park among others. Nature lovers can enjoy unobstructed views of Lake Ontario in the south and panoramic visions of the natural surroundings of Etobicoke. The Empire Communities is a major integrated community housing development in Canada. Based in Vaughn, Ontario, the group has built over 12,000 new homes and condominiums in Texas and Ontario. Since their inception in 1993, the company has strived to set new benchmarks in terms of quality and architecture ever since its inception. It has diversified into major communities of the Texas market and has plans to launch new real estate programmes ranging from mid- $200s to over $1, million. Empire Communities offers well-designed industrial, commercial and residential, luxury projects with top-class amenities for residents. Spacious lobby with 24hour concierge services.